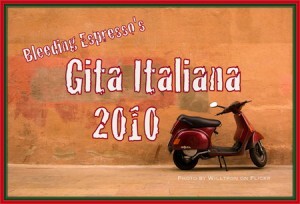 Can you believe we’ve already reached the end of the Gita Italiana 2010? Without further ado, here’s our final installment from Tui of Mental Mosaic. Enjoy! As a recent transplant to the Dallas – Fort Worth Metroplex (via Naples, Italy and the Pacific Northwest) I must agree with the state slogan of, “Texas, it’s like a whole other country.” It’s not only because the state is huge, or the fact that it has its own power grid. There is just something about Texas that sets it apart from other states. Every time I land in Dallas, for instance, I feel like I should get my passport stamped. So how does all this fit in with the Gita Italiana? Well, I’ve discovered that the bel paese and the Lone Star State have a surprising amount of things in common. Don’t believe me? Read on! If you pulled a tortilla chip out of a bag and it were shaped like either Texas or Italy, you might notice. You might even get a few bids if you placed that chip on eBay. At the very least, your friends would probably nod in agreement as you dipped it in salsa and took a bite. Try the same with a chip resembling Colorado or Belgium, however, and people will think you’re nuts. Those shapes are not nearly as striking or recognizable. Texas and Italy, on the other hand, are like the geographical equivalents of Beyonce or Christine Hendricks; they are not afraid to flaunt their shape. While living in Naples, I even had people use my lower leg as a makeshift map from time to time. I confess that I am so bad at geography that this was the only way to get their point across, but hey, it worked. And while I still think there is a market for tights imprinted with a map of Italy, there is definitely a market for anything Texas-shaped. You name it, if there’s a way to produce a Texas-shaped version of a product, someone will do it, and Texans will buy it. I’ve seen Texas-shaped belt buckles, tattoos, muffins, swimming pools, crewcuts – there’s even a Flickr pool of Texas-shaped things. I'm not sure how to pair wine with Chicken Fried Stuff. I honestly can’t say yet how Texan wines compare to Italian ones (ask me again after Texas Wine Month this October) but I can tell you that the European wine industry will be forever grateful to a Texan named Thomas Munson. Munson developed a vine hearty enough to resist phylloxera, an aphid-like critter which wreaked havoc on grape harvests in the 19th century, so propose a toast to him the next time you open a tasty bottle of Italian red. A sign at my favorite Chinese restaurant in Texas. While living in Naples, I enjoyed learning phrases in Neapolitan dialect, as well as songs in dialect such as “O Sole Mio,” and “Funiculi, Funicula.” I was surprised, however, to learn that Texas has its own dialect. I am not just talking about the contagious Texan twang. Texas actually has its own unique version of German, thanks to generations of immigrants. The German word for “skunk” is stinktier, for example, while the Tex-German variation is stinkkatze. It would take a lot to rival the buffoonery of Italy’s prime minister, Silvio Berlusconi, but from what I’ve seen here in Texas, Governor Rick Perry has his moments. Not only has Perry been dubbed “Governor Good Hair” due to his immaculate coiffure, but he’s been known to impulsively smooth the unruly locks of strangers in the audience during public appearances. Also, back in April of this year, Perry shot and killed a coyote … while out jogging! He claims the coyote was menacing his pooch, but I have my doubts. I’ve lived near coyotes before, and they are very skittish. In any case, who packs heat on their morning jog? Confusing restroom sign in Dallas. If you’ve ever spent time in the Italian countryside, chances are you’ve seen those huge, black bumblees known as Calabrone. While your average bee buzzes like a Vespa (pun intended!) 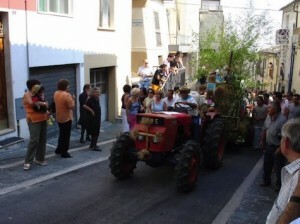 a Calabrone rumbles like a Harley Davidson, and just like a “hog”, you can hear them coming a mile away. Fortunately, Calabrone rarely sting humans. Turns out that Texas has its share of big bees, too. Lately I’ve spied Cicada Killer Wasps in our yard. As the name suggests, this creature kills cicadas (which, I might add, is another hefty-sized bug.) Cicada Killers are an impressive 2″ long and thankfully, like the Calabrone, they have better things to do than sting you. I still tend to shriek and run the other way, though, whenever I see one. Texans leads the USA in wind power. The Texan love of Italy runs deep, but doesn’t veer into wannabe behavior. One incident in particular summed this up for me, it was when the waiter at an Italian place in Dallas exclaimed, “Mangia, y’all!” after setting our entree on the table. At that moment I realized that no matter how passionate this guy was about Italian cuisine, he was still Texan through and through. So there you have it, a brief sojourn off the boot and over to the land of cowboy boots, where there is more in common than you might expect! Tui Cameron is a writer and musician who recently settled in the Dallas/Fort Worth Metroplex after having lived in Italy, Belgium and the Pacific Northwest. She disagrees with the saying, “It’s a small world.” In her experience, it’s actually a great big world with an endless array of places to explore. You can find her on Twitter @mentalmosaic, and at her blog, Mental Mosaic: Even home is a travel destination. Wonderful and so sweet too, Tui; grazie mille! Thanks so much to everyone who wrote, read, and commented on the series; I’ve had so much fun reading about all different parts of Italy from some of my favorite bloggers, and I hope you enjoyed it as much as I have. Looking ahead to September, remember it’s Ovarian Cancer Awareness Month, so there will be lots of fun happenings here (including giveaways!) in order to spread the word about this disease that affects far too many women. See you next month! Today we have a special treat for the Gita Italiana: this morning we’re spending time with Mary of The Flavors of Abruzzo, and then this afternoon, I’ll be posting information about the final book giveaway of August so be sure to check back later as well. But now, welcome Mary! When Michelle proposed the Gita Italiana, I thought about all of the wonderful things I could say about Abruzzo. 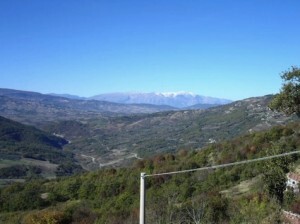 I could talk about the National Park, the wildlife, the breathtaking views of the Maiella that I can see from my town. Or, I could talk about how close we are to the sea and the wonderful historic treasures that are all around us. But, as fantastic as all of those things are, they are not what really comes to mind when I think about my life here in the heart of Italy. Upon moving to Abruzzo it felt as though I almost went back in time because this place is so closely linked to the rhythms of the earth. That link is so strong that even a person who has newly arrived can feel it. Yes, I know all about harvest time and I’ve grown my own vegetables, but I’ve never felt as attuned to the seasons as I do here. Even though we live in a modern world with computers and cell phones, we still take part in those seasonal activities that have been going on here for generations and generations, back into the mists of time. Forget about football games and hayrides. These seasonal activities are all related to putting food on the table. Spring is the time to plant and you’d better plant when the moon is in the right phase or your seeds won’t grow the way they should. Then the grain is harvested and the fields prepared for the next crop. Of course, summer is when we enjoy the abundance of fruits and vegetables from the garden but then, in late summer, it’s time to preserve part of what the garden has yielded and can some tomatoes. You can make sauce or can them in chunks or even whole, but everyone does it. It becomes a part of conversation. No longer is the opening phrase about the weather, now it centers on whether or not you’ve done your tomatoes yet and how you do them. When early fall rolls around it’s time for the vendemmia. Then later comes olive harvest time when everyone gathers their olives and takes them off to the frantoio for making oil. And once the cold temperatures arrive it’s time to butcher the pigs and make sausage. Yes, there are some people who don’t do these things, but the majority of people are involved in at least some of them. We don’t have grapes, for example, nor do we raise pigs, so there is no butchering for us (thank goodness), but our lives still revolve around these activities as we watch the tractors full of grapes go by (or peaches when the season is right). And, while you can sometimes get some vegetables and fruits out of season here, you pay very dearly for them. Unlike supermarkets in the states that seem to have grapes and cherries all year round, you can really only get them in season here. Consequently, I had no idea that there were winter vegetables, like broccoli for example. While life is not perfectly idyllic here, there is definitely a fair amount of tranquility that comes from being so closely bound to the seasons. Since moving here, my life has definitely changed, for the better. Some people said Mary was crazy when she walked away from a promising IT career to move to her ancestral town in Italy. Now 4+ years later she works part-time as a Freelance Translator and Writer and the rest of the time she spends chasing after her 2 year old son and enjoying life in Abruzzo. 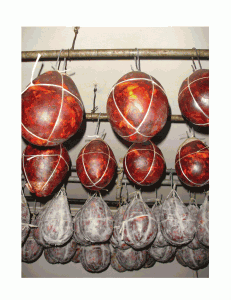 You can catch up with her on her blog: The Flavors of Abruzzo. 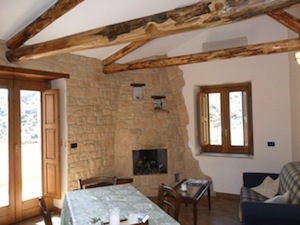 Today’s Gita Italiana stop takes us to the Salento courtesy of Tina Ferrari, who you can find at TinaFerrariTango.com. Welcome Tina! Sometimes I get so caught up in daily life that I have to stop, look around, pinch myself and realize where I’m living. The Salento is the sub peninsula that makes the “heel” if you are looking at a map of Italy. It’s different than the rest of Italy. Every region has its own identity and traditions, but here in the south, the difference is pronounced. On one hand, it’s the Italy people dream of, untouched by mass tourism. Things are slow, shops close from 1:00 to 5 or 5:30 in the afternoon, people hit the streets of Lecce in bici, on their bicycles, green grocers can be found everywhere, and the gelato is just right. 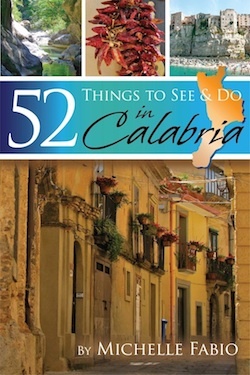 All the things you might fantasize about when thinking of Italy, you will probably find here. 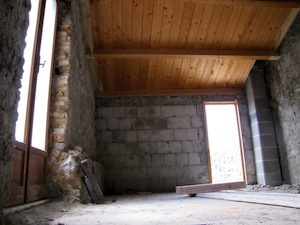 On the other hand, I feel like I’m in my own special place, removed from the rest of Italy. 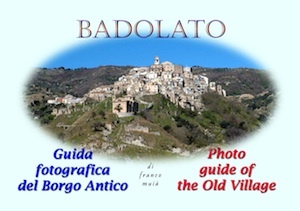 I think anyone in southern Italy, be it Calabria, Basilicata or Sicily, might feel the same way. 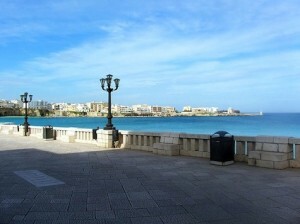 Being at the bottom of the peninsula, the Salento is nice and isolated. It’s not the easiest to reach, and when you do finally get here, you feel like you are separated, in a way, from Italy. On the train along the Adriatic Coast, as soon as you pass Bari, your view out the window suddenly consists of red soil (with olive trees) muretti a secco (dry stone walls characteristic of this region), and the occasional trullo. The Salento even has its own railway system: the Ferrovie del Sud Est! It’s truly a parallel universe. At the regular TrenItalia train station in Lecce, you’ll find chaos and grumpy employees, as you would at any station belonging to the national train network. But pop into a Ferrovie del Sud Est station in one of the neighboring Salento towns, and it’s a completely different set up. Complete tranquility. “Is the train for Lecce running?” you ask. The man at the biglietteria, calm as can be with glistening eyes, shrugs his shoulders, nods his head and says, “Sure.” You press further: “What time?” He nods his head again and answers, “Quando vuoi. When you want.” You move to the platform to wait for the train. The same man comes out and manually lowers a bar to block automobile traffic from crossing the tracks, and finally, a tiny toy train pulls up. Off you go. On the other hand, it is also a region of progressive artists. Plenty of modern talent comes from the Salento, including musicians such as Dolcenera, i Bambini Latini and Sud Sound System. 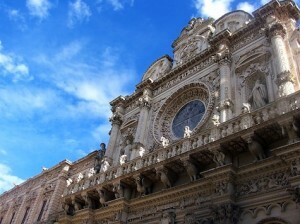 In Lecce, artisans sell their wares on the streets on summer evenings, and galleries abound with original, avant-garde creations by local artists. Perhaps the language here is Italian, perhaps this region belongs to the republic of Italy, but once in a while I realize, as I walk through Lecce’s historic center in the morning, looking up at homes made of white-gold Leccese stone and the contrast against the Mediterranean blue sky, or as I make my way down the road on the way to Gallipoli, surrounded by oleanders and prickly pears, with the salty scent of the Ionian Sea in the air, that I am in a very special, truly unique Paradise in the south: the Salento. 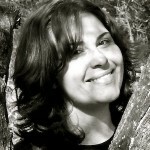 Tina Ferrari is an Italian-American tango dancer, translator and writer living in Lecce. You can find her at TinaFerrariTango.com. Tomorrow: a quick trip to Abruzzo. 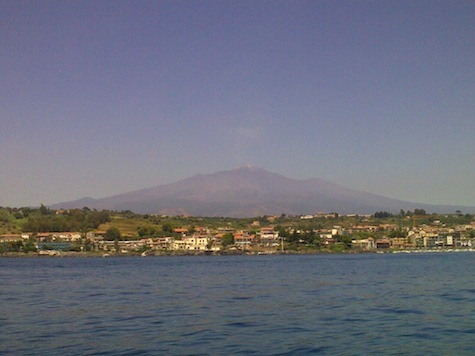 Our next Gita Italiana stop is just a ferry ride away from me in Sicily, but I’ve still never been to see Mount Etna in person. Giving us the goods on this hot spot (ha!) is none other than Alexia Murray of 2 Kids and a Dog — you remember the family with the hilarious calendar and YouTube videos? Welcome Alexia! I’m brusquely awoken by something pounding on my belly. I open my eyes, and realize it is a small boy, an odious boy, who happens to be my son. He dashes off cackling and I catch sight of the clock. Darn! The alarm didn’t go off! We’re late! We gotta get out of bed and head up the mountain before (dramatic, scary music) the tourists get there! As some of you know, my husband Nick is Sicilian and we always spend part of our summer in his hometown, Catania. 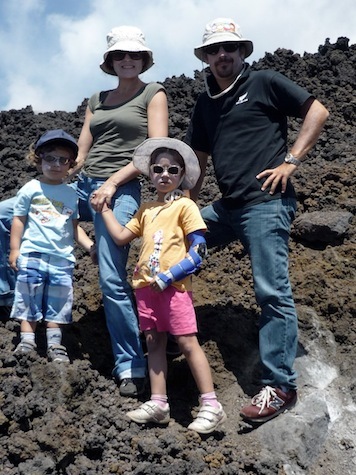 One of our yearly day trips is visiting the Etna volcano, a massive active volcano standing 3,329 meters high that dominates the east coast of Sicily between Messina and Catania. The last eruption was in April of this year. 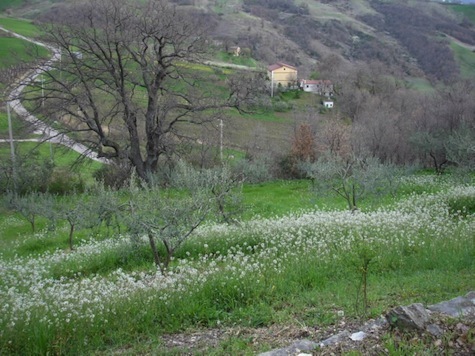 In 2001, a crater even opened dangerously close to the town of Nicolosi. The worried townspeople brought out their Saint from the church and the lava stopped. A miracle! “I’m going to need another miracle to get my family moving,” I think as I gaze across the bed and see Nick snoozing beside Luce, our 6 year-old daughter. Only 3 hours later we’re in the car, picnic packed, camera in tow and donning high-tech mountain gear (clothes from Nick’s prepubescent era). Obviously, being “Catanese”, Nick does NOT consider himself a tourist, but a LOCAL, a gruff mountain man, bordering on volcano expert…even though he goes to the Etna once a year (using his satellite navigator) and doesn’t know the difference between magma and lava (do you?). As we snake up to the Etna (about 30 km from Catania), Nick grumbles that we’ll get to the cable-car station just as the bus loads of (scary music) tourists start swarming in. He pleads, “ let’s just go to the beach!” No way Jose, the kids demand to eat their salami sandwiches face to face with the mighty Etna. Finally, we pull up to the “rifugio Sapienza” at 1910 meters. Nick’s mood changes (thank God) when he immediately finds a parking spot. A miracle, he announces. My day starts to look better. Pasty-faced with total sunscreen, we climb into our own private cable-car, the kids buzzing with adrenaline. Luce, the wise one of the family, inquires, “Mom, what happens if the volcano explodes now?” I laugh and reply, “don’t worry about it sweetie, it’s not going to happen…” But the question echoes in my head… “crap, what happens if the volcano really does explode, NOW?” I instantly file the thought into the “I can’t deal with that” section of my brain. The 15 minute cable-car ride flies by, apart from a brief episode when the gondola (no, not the ones in Venice!) suddenly stops and we dangle in thin air for what seems like an eternity. Liam jumps up exclaiming, “I need to go poo-poo,” making us lurch precariously. To avoid a panic attack, I spend the rest of the gondola ride on an astral voyage. At 2500 meters, we roll out the plaid blanket and devour our picnic. I scoff at the (scary music) tourists, some in flip flops, struggling to walk over the jagged lava rocks, others with straw beach mats under their arms. I wonder, “what were they thinking when they decided to spend the day on the highest active volcano in Europe?” I gaze down at my feet, proud to be wearing my robust high-top sneakers. That lava ain’t got nothing on me in these. The view is stunning from our picnic spot. We’re on top of the world. Everything around us is black, while Catania and the immense sea gleam below us. I can practically see all the way across Sicily, to the Madonie mountains where (more dramatic music) Corleone is… It’s amazing. After lunch we get on a jeep-bus with gigantic wheels, a relic from some lunar expedition. The NASA-mobiles will take us up to 3000 meters to visit a small active crater! The kids tingle with anticipation. On the way up Luce eats three ham sandwiches, a banana, a zucchini omelet and belts out “Old McDonald” to the dismay of our fellow travelers. Liam, on the other hand…falls asleep. Nick is very pleased as he will have to carry Liam on his back like a donkey when we take our one-hour hike around the crater. Upon arriving, we are greeted by our guide, a REAL, although slightly elderly, mountain man with a thick Sicilian accent who occasionally utters a few words in French (in the same Sicilian accent). Do I look French, I wonder? I don’t know. As I take my first step behind our guide I feel something strange on my foot. I realize that my sturdy, reliable high-tops are disintegrating. The soles are detaching and I’m going to kill myself on the top of a mountain in Sicily. So much for my high-tech gear, I might as well have worn flip flops. 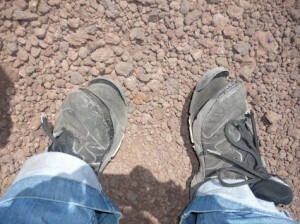 However, the situation is not so dismal as I soon figure out how to walk so the soles don’t catch on the craggy rocks. I know I look like I’m doing a Monty Python “silly walk,” but I hold my head up high, avoiding the (scary music) tourist’s curious gaze and focus on the incredible moon-scape around me. The top of the volcano looms above us, smoking enigmatically. When I put my hand on the ground it is warm, and when I dig a bit, it’s hot! Steam bellows out of the smaller crater below us and is whisked off by the wind. Oh, and by the way, it’s freezing. So, we take out our shiny, ’80’s triacetate-polyester tracksuit jackets and bundle up. Lookin’ good, feelin’ good. But all in all, a great Italian gita. Alexia Murray is an American mom living in Rome with her Sicilian husband (who claims to descend directly from the Druids), two vivacious kids and their dog Hamlet. Together they’ve created www.2kidsandadog.com, a site that hosts an ongoing comic web series, which thrice weekly reveals in short snippets what really happens to make their ridiculous yearly family calendar. Documenting the activities is a multi-tasking mom and a burnt-out pop, cooky costumes, home-made sets, an absurdly busy doorbell, a slow burning soup on the stove, surreptitious sibling rivalry, and a lot of barking. All photos courtesy of Alexia Murray. Also, for a live shot of Mount Etna, check out the Mount Etna webcam. Grazie mille Alexia and family! 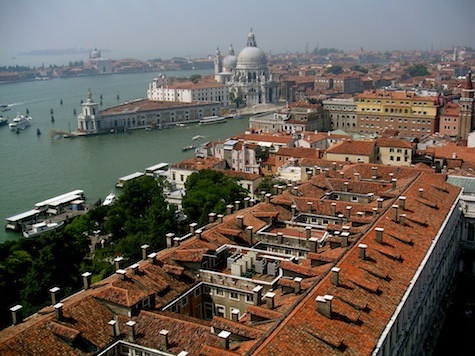 Today’s stop on the Gita Italiana takes us to Venice with Robin of My Mélange. Welcome Robin! Venice will always hold the honor of being the first city I visited in Italy. One could say that Venice is partially responsible for my falling in love with Italy. It certainly started the ball rolling. I remember that magical moment as I caught my first glimpse of the Piazza San Marco in Venice from the Alilaguna as it sailed along the jade waters, on a bright, sunny day. It’s an indelible memory. One that I hold very dear. But it isn’t the only memory I have of Venice. There are many. I thought I’d share six other things that I remember about Venice that put a smile on my face whenever I think of them. Hopefully they paint a vivid picture of what it’s like to spend time in one of the most unique cities in Italy. 1. Traversing the tiny footbridges and getting lost in the maze of calle, especially at night. 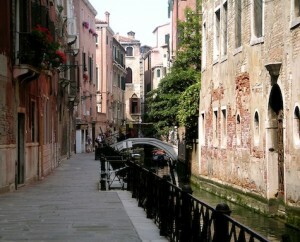 Wandering with no particular place to go is one of the best ways to discover the real Venice. 2. The lovely gelato shop owner who not only had the best gelato, which we enjoyed no less than twice a day, but who holds the honor of being the very first Italian to ever say ‘Ciao‘ to me. 3. The manager of the tiny B&B where we stayed, who was a dead-ringer for Hank Azaria’s character, Agador (Spartacus), in the movie ‘The Bird Cage.’ He was delightful and each morning he served us warm cornetti filled with peach preserves alongside the best cappuccino, prepared with his tiny Bialetti. 4. Taking a mid-afternoon nap while listening to the beautiful sound of piano and violin wafting into the windows of our room, from the Music Conservatory across our canal. 5. The quiet. The lack of cars and scooters. I enjoyed hearing every footstep, every clip-clop of a stiletto heel. It was lovely being lulled to sleep every night by the sound of lapping water and the occasional boat that would slowly make its way passed our open window. 6. Our dinner at Ai Cugnai, a family joint, where the laundry dangled precariously above our heads and where the entertaining owner was more of a draw than the food. We watched her sip wine from other diners’ glasses and present dishes from the kitchen to everyone in the dining room before serving them. She spoke not a word of English and at the end of dinner, she pinched my cheeks and told me to call her mamma. Priceless! 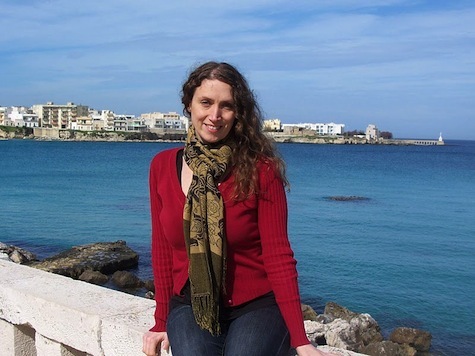 Robin Locker Lacey is an Italy and France travel consultant, freelance travel writer and photographer who hopes to one day realize her dream of living La Dolce Vita in her beloved Italy. Her passion for European culture and lifestyle is featured on her site, My Mélange, which includes travel essays, photos, recipes, restaurant and hotel recommendations, ideas on how to live La Dolce Vita from abroad and travel tips–she is the self-professed Queen of the Carry-On bag and *will* convince you to convert. She is addicted to social media – you can follow her on Twitter @MyMelange. Domani . 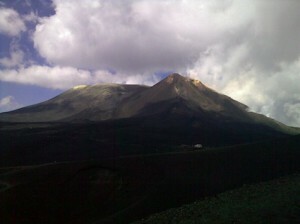 . . Mount Etna in Sicilia!